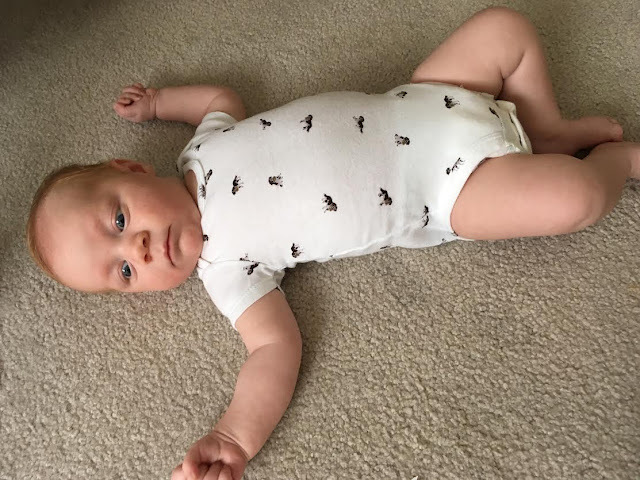 So about a month ago, V had a massive poop out in one of my favorite onesies he has. After washing it several times to get the poop out, the snaps started to tear off. I was really sad and my first thought was to see if you could buy the onesie separately from the 3 piece outfit it came with (since the other two pieces are in great condition still). That was a fail. 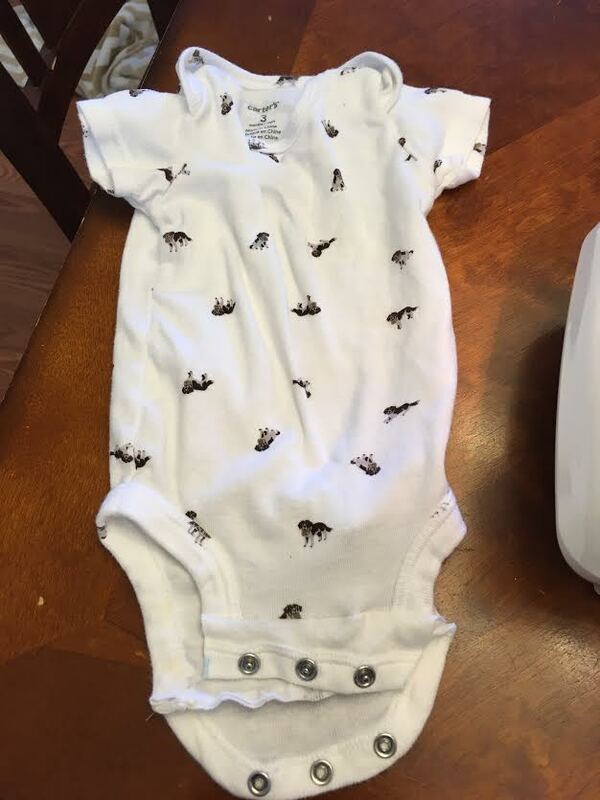 Although Carters was super nice to send me a coupon for the trouble, they don't sale the onesie separately, or the outfit anymore at all. So I was pretty sad about that. I know it's a little silly to be so attached to a baby shirt, but it happens. It just does. 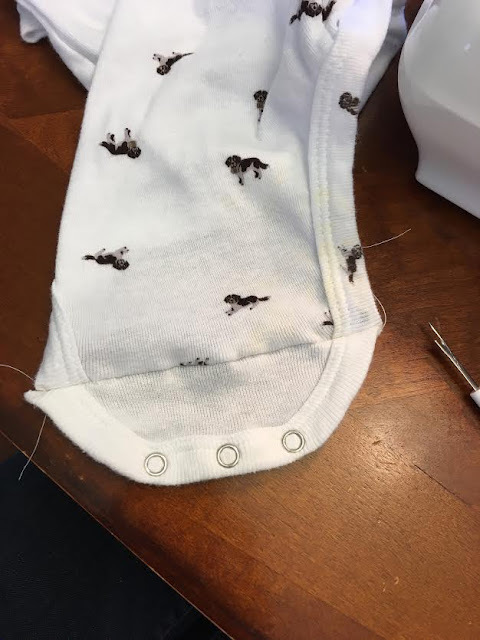 So I let the little onesie sit on my shelf for the last month while I tried to think of a solution besides throwing it away. Then, yesterday morning, this idea popped into my head! And it worked! I am by no means a seamstress. Please don't think I have talent in this area, I don't. My sister got all those genes in our family and the closes I came to sewing anything well was quilting. I once made a skirt, and I swear to you, I followed the pattern to a T, but when the skirt came out, it was like a huge box. The draw string barely cinched tight enough for me to even wear it the skirt the one and only time that happened. I only passed sewing 1 in high school because my mom was a champ and did most of the work for me. So, no I don't sew. I'd love to be good at it, but I'm not. I try really hard to be good at it, but I'm not. And I keep telling myself that if I keep practicing, I'll be good at it. And I hope that's true. 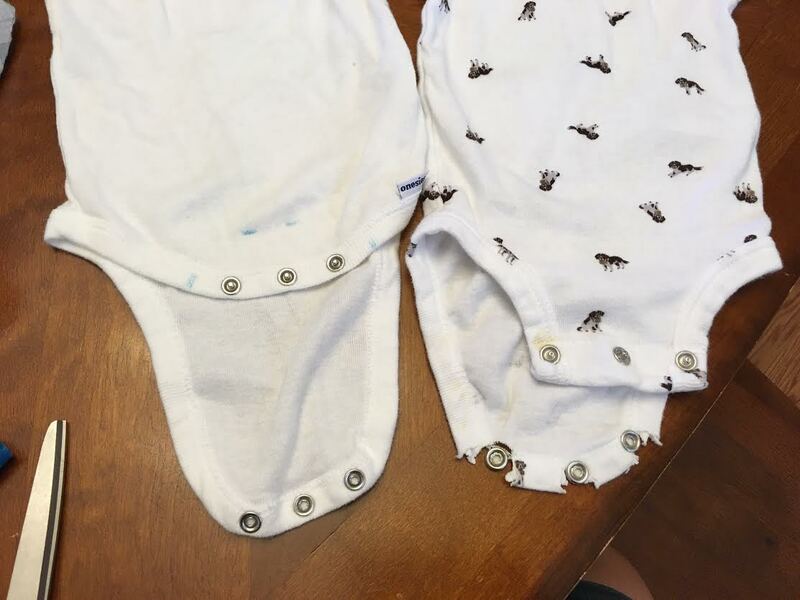 But, anyway, I was pretty proud of myself for this idea of fixing the onesie, and because it actually worked and looks...you know, decent, I'm going to share it. That way if anyone has this happen to them, they can have an idea of how to fix it, even if you're not good at sewing. First of all, I found a plain white onesie that we had forgotten about and was still in storage. I measured the length of the snaps on the old onesie and then I marked how much I needed to cut off of the new onesie. Cutting the clothes was really the scariest part. But I cut off both the bottom snaps and the top snaps so that they would match and snap together. If I would have left the top snaps on the puppy onesie, they wouldn't have matched and snapped together. So make sure your snaps go together. People may be thinking that this is an obvious thing to do, but my first instinct. 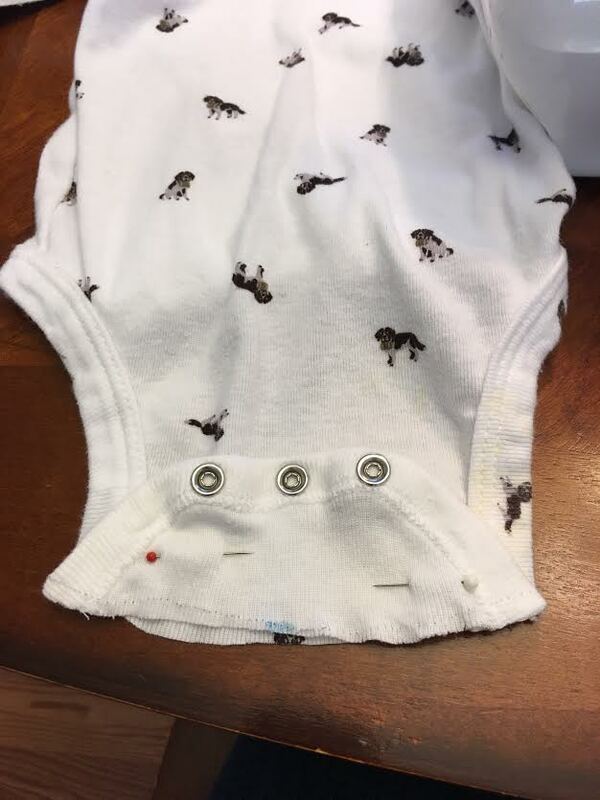 I cut the snaps off of the puppy onesie and then pinned the wrong sides of the pieces together. Then I stitched a straight line across. I did that to both sides of the onesie and then I made sure that they matched and snapped together. Then I put it on him to make sure it worked out! Lucky for us, it did! I felt pretty accomplished. And even though you can see a small line where the seam is, that part will almost always be covered by pants, so it doesn't even matter. Yay! 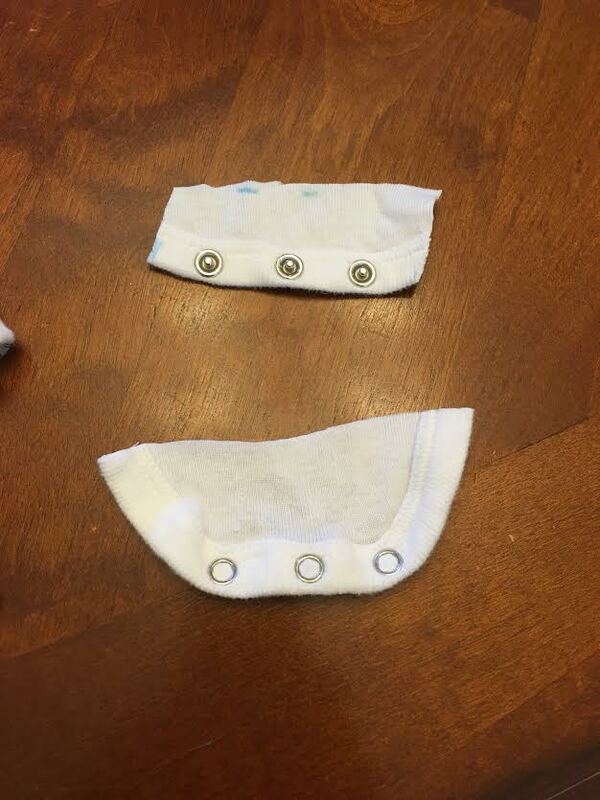 I hope this helped someone else fix their favorite baby outfit. Any favorite clothes you've had to throw away?